Gail Ingram: Congratulations, Joy, on your wonderfully touching and perceptive story of an elderly woman’s feelings of disconnection from the world around her. Yet, you are only fifteen yourself. What made you want to write this story about aging? Joy Tong: I quite like exploring concepts and ideas through writing, even if I haven’t specifically experienced it myself – and aging is something that is happening to all of us, and will happen to all of us. In a way, writing about it helps me understand these things better and to work deeper into different perspectives around it. My grandmother lives with us in New Zealand as well, so some of the aspects of aging in this story is inspired by her. I tried to put into words the sort of feelings she might have, especially living in a country so foreign to her. Through this, though it has evolved and become quite different from its conceptual inspiration, it helped me explore something I was not so familiar with and offered a different view on it too. GI: You effectively use the metaphor of failing sight to represent the old lady’s feeling of disconnection. How does your creative process work? Do you dream stories up in the bath? Do you make a time in your day to write, or do you write as the idea takes hold? JT: Often I’m found writing or reading a good book in my spare time, and I like writing lightly and often to ward off the dreaded writer’s block. However, school usually takes up quite a bit of time so I don’t have a regular writing schedule – I just take the chance when I can. My ideas very much are dreamed up in the bathroom, or right in the moment before I go to sleep! The most annoying thing is that if I don’t somehow record it immediately I’ll have forgotten it by the time I wake up the next day or finish my shower, and it’s a little hard to try and record it when you’re warm and comfortable and on the verge of falling asleep. Oftentimes the inspiration comes in ideas or prompts, or sometimes an interesting phrase that’s surprisingly well crafted. I have a notebook as well as a doc on my laptop which is full of these little bits of inspiration and half-developed drafts, which I usually take a look at if I’m out of inspiration. In fact, the idea for ‘The Cold’ was mostly founded in two ideas that were written next to each other on my doc – I had seen and described the exact scene of the father and two boys whizzing down my street, and I had also written a short prompt about how my grandmother, at times, seemed like she would stare but not really understand or see what she was looking at. I could already see the links between the two and wanted to explore what could happen if I wrote a piece merging the two together. ‘The Cold’ was what happened! GI: What subjects do you often gravitate towards in your writing? JT: If I take a look at past writing and current drafts, I find that there’s quite a variety of subjects. There’s quite a bit on survival and identity – life as a teenager, what it means to be a woman in this society, to be Chinese, rebellion, feminism, rights and privileges. Lots are written for their sensual appeal and I enjoy exploring a lot of visuals and other senses not for any particular purpose other than just chasing after the sort of atmosphere I feel like creating in that moment. I like to visualise exactly the kind of place or feeling in my head while I write, and I try to capture what I observe. My writing also tends to wind up towards the ‘big’, almost cliché ideas – life, death, love, age. I like exploring the innocent or surface-level side of these things, but also to dive deeper into the different interpretations that they might offer. I enjoy taking a facet of these massive ideas and really developing the direction I take with the writing. Clichés often creep in when I write about these things, though I do try to shy away by avoiding tackling the ideas fully, but rather taking my own individual or a very specific approach towards them. At the same time there are some mundane aspects to my writing – lots of urban settings, coffee shops, references to music and nature. Not much of a trend, really. I just love having fun and playing with ideas and images in my writing. GI: I liked the efficiency with dialogue in this story — that exchange at the fast food outlet – and the deft way you handled scene changes with no unnecessary explanation. How long have you been writing? Have you had any mentors, teachers or other writers that have inspired you? What other writing, apart from flash fiction, are you interested in? JT: I honestly can’t quite remember when I properly started writing for myself, though I definitely know I started reading widely before I was inspired to write anything. I think around 2011, when I was 10 or so in Year 5 at primary, was when I actually started enjoying writing (I loathed the school writing schemes before that). I still disliked writing things like reports or recounts for school, as I’d much rather escape to that fantasy land of fairies and 10-year-old shenanigans that seemed much more interesting than life on this Earth. My Intermediate years at Year 7 and 8 were much better and helped my writing to flourish. Mrs Ellery, my literacy teacher for those two years, took us on excursions to find inspiration for our pieces and was incredibly supportive of everyone’s style and work. I had great fun in her classes and she helped open up many avenues and freedom in my writing. My current English teacher at St Cuthbert’s, Mrs Ali, is absolutely one of the best I have ever had. She took us to Writer’s Festival, and encourages reading and writing widely. She has helped me personally to write much better outside of just creative prose and poetry, and her critique is particularly constructive. 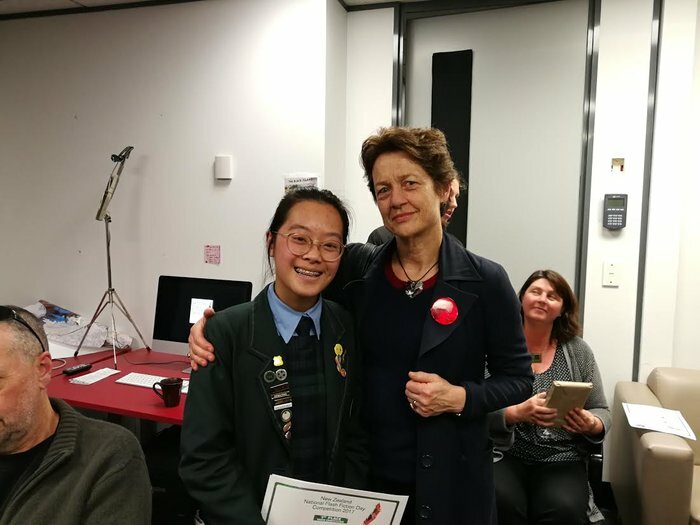 My writing has seriously improved over the course of this year through a lot of her guidance, and she really works on honing the writing muscle through unique activities in class, holding some very worthwhile workshops which taught me important skills in creative writing, and recommending events and opportunities (like flash fiction!). I’m very partial to poetry as I find the form quite malleable to suit my style of writing. It allows me to entertain and develop the little prompts that come into my head into fully fleshed pieces. I also like poetry in how grammar and punctuation can be less prioritised over its artistic structure or the meanings that you can put into every word. Poetry, I think, more easily captures moods and feelings and expresses them the way you want. I do also enjoy writing short stories, usually a few pages long and just for the fun of exploring language and plot and character. Columns and opinion pieces are also interesting, though I’ve only recently found my interest in it. These do depend on the topic, however – I really have to have a strong opinion and be genuinely interested in the topic to write a good opinion piece. GI: How did you discover flash, and what was the first flash fiction story you wrote? Was there anything in particular that attracted you to the form? 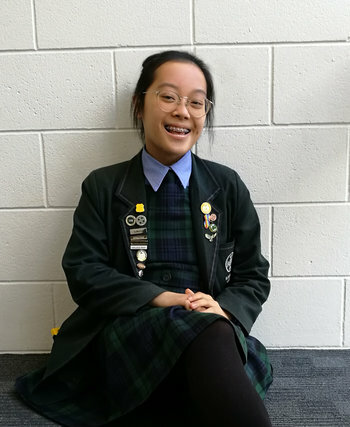 JT: I discovered flash through an email my English teacher sent out to the class, telling us to enter this competition – so in fact the three pieces I entered are the first flash fiction stories I’ve written! I wrote ‘Imperfections’ first, as I felt particularly inspired to try and capture the mood I had in mind, and it just needed a little editing to fit the criteria for the flash competition. I wanted to try flash out particularly because it seemed like a challenge to myself to fit a whole prose story within 300 words, which I knew would need quite tight structure, really clearly defined ideas and making every word matter – things I’ve often lacked this in writing prose as I ramble and over-write a lot! Also, after I read some of the flash fiction found on the website, I really liked some of the subtlety, the ways the stories changed and just the general touch that the pieces offered. Mostly I was aiming to improve while trying something new and fun. Usually I prefer short works anyway, especially poetry because the form itself allows me to create really specific, developed images and stories succinctly, and communicate ideas in an artistic way that I hadn’t found through prose (yet). But with flash fiction, I felt that it offered a similar sort of form to allow me to work better with prose. GI: What is your process of writing? Do you have a special place and time when you write? What do you like best – the blank page or the editing stage? JT: I think my writing process changes slightly for every story, but the same thing essentially happens: I take an idea (or several) from my cache or from something new that’s popped into my head, and sometimes I very roughly figure out how it will go. What form will it take? What’s the storyline? Characters? Other times I just have a sort of end image that I have in mind or a specific mood I want to create. Then I just start writing and sometimes it will deviate from my original plan, sometimes it won’t. I usually just let the story travel however it wants, and many of the different changes or plot movement actually comes when I am writing. Then I usually do some quite brutal editing and also get a second or third opinion on the piece. The phrases or parts I cut out, especially if I quite liked it but it just didn’t fit or wasn’t necessary in this particular piece, I still make sure to keep in my ideas doc or notebook, to recycle for other stories. Editing goes on for a very long time, because there is always something to make better and my vision of it changes over time. I don’t have a specific place or time to write, as most of it is me holding onto images in my head and observing what happens to them and trying to capture that in words. However, some of my better writing has happened when I write at night, especially very late at night. Some have also been written from under the blankets in bed or sitting outside on a sunny day. I do, however, like wandering the city or finding interesting places to spark my imagination. It’s hard to say whether I prefer the blank page or the editing stage – there are merits and challenges of both. I love that the writing stage allows the real story to work its magic, but at the same time the blank page ahead and actually working out the details to the writing is incredibly daunting. I also love editing in that it can turn a draft into an actual work. However, editing can be a pretty brutal process and it can be hard to find the direction you want to take the piece when you’re holding onto a few lines that you’ve become attached to. It’s also hard to see the end in editing, because there are always tiny things that help make the piece better. There’s been several instances where I’ve gotten sick of trying to edit the same piece so many times! Editing itself is a process in which I only learnt how to do efficiently this year. Perhaps if you had asked me the same question a while back, I’d definitely say I prefer the blank page stage. I loved and still do love the brimming potential it offers, where a small idea can be taken and the way words flow when you are inspired. But these days I think I prefer the editing stage – the critical eye that polishes a piece into something better, whether that includes drastic or small changes. I like that after a few days I might come back to the same piece of writing and have a fresh direction I want to take with it, and the end product of diligent editing is always something to be proud of. But I’m a changeable person – who knows what I might like better tomorrow? GI: What are you planning to write next? JT: To be completely honest, I’ll be catching up on all the schoolwork and essays I haven’t written! I’m probably going to return to poetry a little bit, though I am sure flash is going to frequent my writing – I already love writing ‘slice of life’ style stories, but I like the way flash really condenses it and requires me to put lots of thought into structure and my word choices. I’m currently working on a few poems that seem to click together really well to see if they could work as a small set. At school I’m also working on a collection of pieces – creative writing, interviewing and column-style writing all mixed together, which is very fun. I’m looking forward to a bit more editorial writing as I’m developing my voice in that genre. 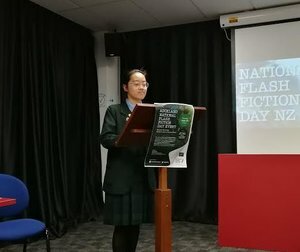 GI: And last of all, how did you feel when you heard you won the National Flash Fiction Day prize, and how did you celebrate once the official event was over? JT: Absolutely astonished and honoured! I didn’t really expect my story to make the long-list, much less win the national prize! I don’t think it fully sunk in until I got home. I lay in bed and went, “Wait… did I just?” I felt incredibly grateful but also had quite a boost in self-pride in knowing that something I wrote could actually deserve first place. If I’m completely honest, I celebrated by not doing my homework that night and going straight to sleep for once (boring, I know) in the middle of an assessment-crammed term. I did, however, celebrate the win amongst friends and family the next day in receiving lots of love and sharing the pride of winning the prize.